Left to right: Aqeed Chief Product Officer Hadi Radwan and CEO Rachid Abi Nader. Having the “DNA of a startup, and the strength and stability of a corporation,” sure sounds like something every fledgling venture out there would envy, and Aqeed.com, a new UAE-based insurtech platform, claims to be blessed with such a structure. 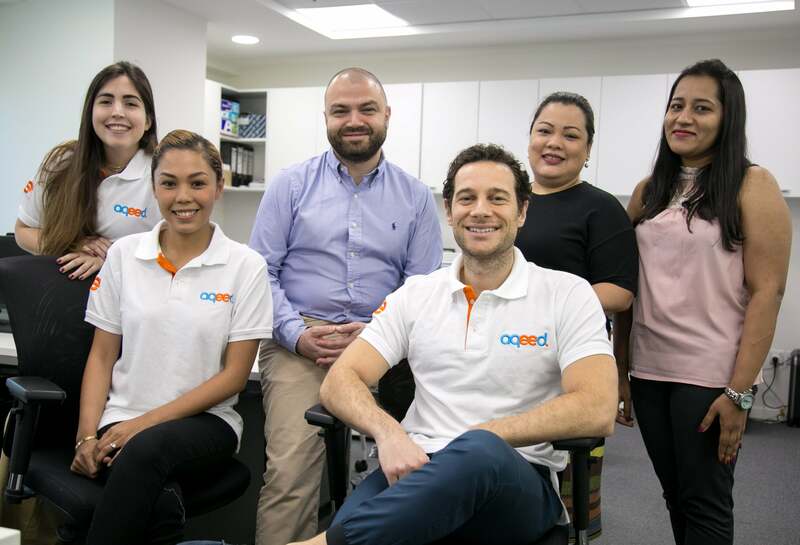 Aqeed, a technology company focused on helping consumers understand, manage, and buy insurance on their platform, is founded by the shareholders behind international reinsurance corporation Barents Re, and Equitrust, a group company of MENA’s media and advertising enterprise Choueiri Group. Launched in April 2018, with an investment of US$18 million in funding from their founders, Aqeed’s management is led by experienced industry hands including CEO Rachid Abi Nader (previously a Lead Consulting Director, Insurance, Middle East at PwC), and Chief Product Officer Hadi Radwan, formerly head of M&A with a leading insurance group in Dubai. “Insurance is one of those industries being disrupted globally,” Radwan says. “It is being revolutionized thanks to new technologies allowing the reinvention and digitization of the business. However, insurance in the Middle East is still lagging behind.” Referring to the current perception of the industry as being “complex,” he says Aqeed was built to accelerate the digital transformation of the conventional sector in the region, and align it with global trends. From the investor’s point of view, Patrick Thiriet, Chief Strategy Officer, Choueiri Group says the company is “delighted” to partner with Aqeed in their endeavor to ease the life of MENA consumers. “Our capacity to reach out to those consumers in the region is certain to be an asset, as they gain traction with their unique offering,” he adds. Having kicked off with motor insurance, Aqeed allows customers to buy and compare car insurance in a matter of minutes on their platform, and at the time of writing, a mobile app is also in the works to facilitate the process further. Customers can make use of a dashboard that’ll allow them to access documents and policies in force, contact insurance companies, view how much they are paying, and get notified of their upcoming renewal dates. The team is also planning to add home and travel insurance products to the portfolio soon. “The typical MENA customer expects to be well informed about the options available to them, pay the right price, and be properly taken care of when they have a claim,” says Radwan. And with Aqeed’s emphasis on showcasing its “key pillars of simplicity, transparency, and accessibility” in the region’s insurance space, addressing these needs figures high on the startup’s agenda. Good times ahead! The Aqeed team. Image credit: Aqeed.com. What are your three top tips for the region’s startups to secure investments for their ventures?